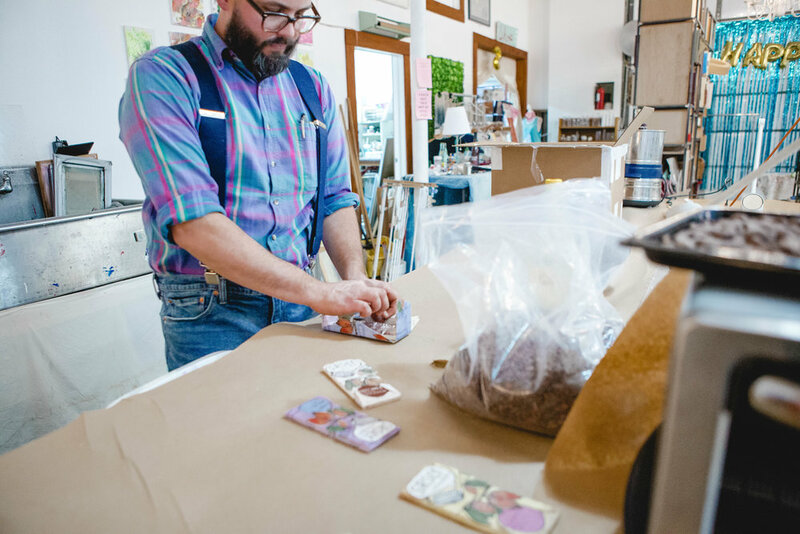 CRAFT Austin hosts different workshops just about every day. In the past they've put DIYs that range from screen printing to soap making. 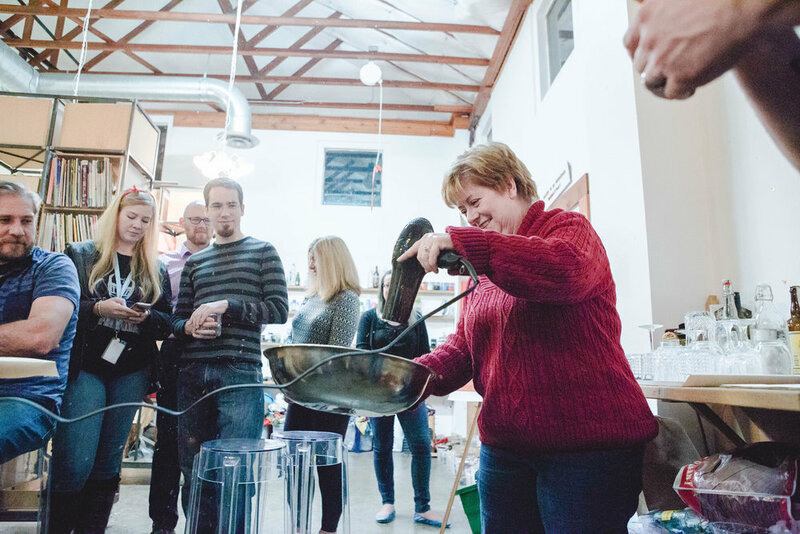 For this particular event, CRAFT invited Bob Williamson to teach a class on making chocolate from bean to bar. Bob Williamson, founder of SRSLY Chocolate, loads up his equipment to bring inside CRAFT Austin to teach his chocolate workshop, "From Bean to Bar", on Friday, January 26th, 2018. In preparation for the class, Williamson unwraps his chocolate bars for participants to sample. Before his career in chocolate making, Williamson found his passion for food while working in the cheese industry. From there, he transitioned to the chocolate industry because of the pure joy it brings to people. Williamson raises his cocoa beans as he asks participants if they love chocolate. Williamson respects the cacao industry and working with fair or direct trade with the cacao farmers. Most of his cocoa beans come from Guatemala, Haiti, and the Dominican Republic. After roasting the beans to tease out their flavor, Williamson invites Jane Miller to help remove the outer husks using a hairdryer. She was amazed at how easily it was to remove the lightweight hulls, and decided to toss them to give a little "air" on the bowl contents. Miller loves hands-on experiences. Williamson explains that their nibs are roughly ground into a paste and then placed in their granite stone mills. Participants gather around Bob Williamson as he demonstrates the tempering process on his tempering machine. Participates design their own chocolate cover wrapping while waiting 20 minutes for their chocolate to cool in the freezer. 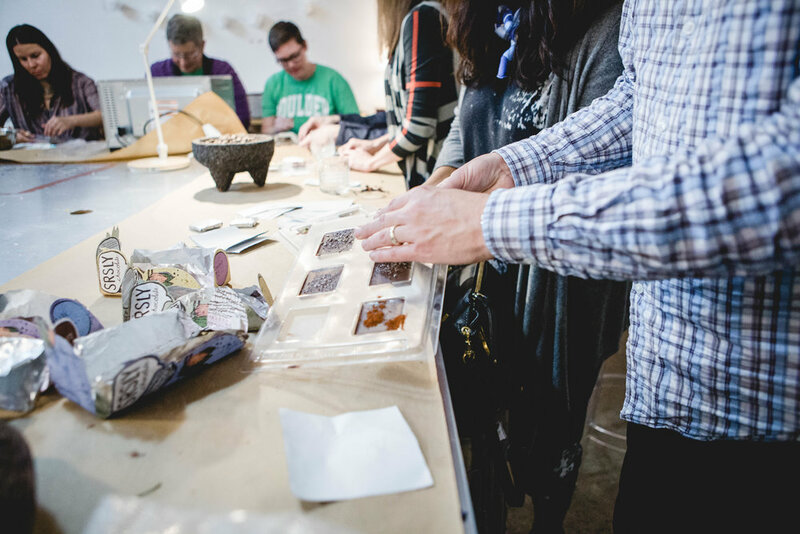 Participants remove their customized chocolates from the mold to be wrapped in foil paper. 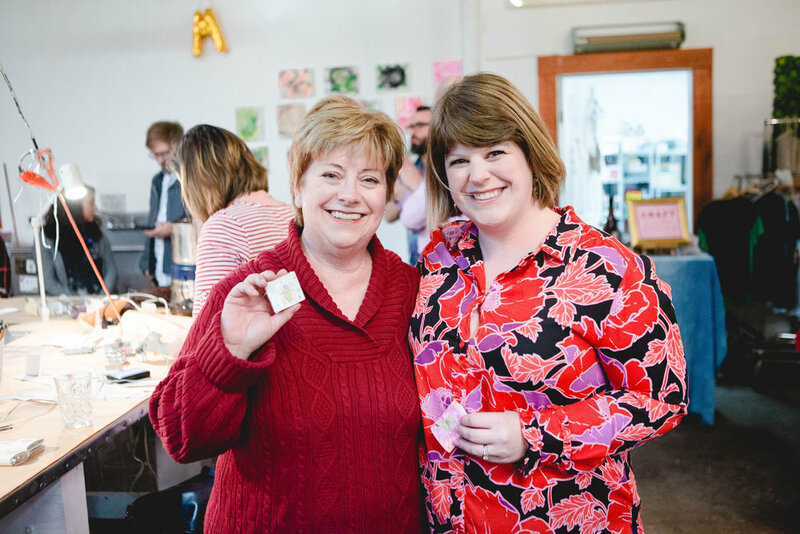 Jane Miller (left) and her daughter, Alice Bolander (right), pose with their finished decorative chocolate pieces at their first chocolate workshop. This event was Bolander's birthday gift to Miller. Bolander explains that she tries to "give experiences rather than physical presents to the adults" in her family for birthdays and holidays.